The use of animal model in research helps to better understand the mechanism of a particular disease as they offer an approximantion of human disease, contributing to the development of treatments and strategy for preventions. The Superpig program uses pig as research model. The pig, for its physiological characteristics, is the closest to humans after primates (monkeys). Having an intermediate model between human and mouse is becoming mandatory also for the validation of new therapies and there is consensus in the international scientific community that the pig represents the most suitable mammalian model for this purpose, due to the similarity in size, physiology, organ development and progression of certain kind of disease. In particular, there are many similarities in cardiovascular anatomy and physiology, including: heart with a dimentional ratio similar to humans, the spontaneous development of atherosclerosis, the anatomy of the coronary arteries, the structure of lipoproteins, the tendency towards obesity and the susceptibility to a variety of stress factors. Pigs are omnivores non-ruminant with a digestive physiology similar to humans; piglets and human infants share similar nutritional needs, as well as predisposition to a number of gastrointestinal pathogens. In addition, there are numerous publications in the field of animal husbandry which could have applications in biomedical research - particularly in the areas of nutrition, reproduction and behavior. Refinement: Improvements to scientific procedures and husbandry that minimise actual or potential pain, suffering, distress or lasting harm and/or improve animal welfare in situations where the use of animals is unavoidable. Cooper DK, Ayares D. 2011. The immense potential of xenotransplantation in surgery. Int J Surg. 9:122-9. Ekser B, Cooper DK. 2010. Overcoming the barriers to xenotransplantation: prospects for the future. Expert Rev Clin Immunol. 6:219-30. Elliott RB; Living Cell Technologies. 2011. Towards xenotransplantation of pig islets in the clinic. Curr Opin Organ Transplant. 2011 Apr;16(2):195-200. Hammerman MR. 2010. Organogenetic tolerance. Organogenesis. 6:270-5. Hammerman MR. 2011. Xenotransplantation of embryonic pig kidney or pancreas to replace the function of mature organs. J Transplant. Hodgson R, Christiansen D, Ziolkowski A, Mouhtouris E, Simeonovic CJ, Ierino FL, Sandrin MS. 2011 Prolonged xenograft survival induced by inducible costimulator-Ig is associated with increased forkhead box P3(+) cells. Transplantation. 91:1090-7. Nishimura H, Scalea J, Wang Z, Shimizu A, Moran S, Gillon B, Sachs DH, Yamada K. 2011. First Experience With the Use of a Recombinant CD3 Immunotoxin as Induction Therapy in Pig-to-Primate Xenotransplantation: The Effect of T-Cell Depletion on Outcome. Transplantation. 92:641-7. O'Connell PJ, Yi S, Carrington EM, Lew AM. 2010. Role of regulatory T cells in xenotransplantation. Curr Opin Organ Transplant. 15:224-9. Perico N, Remuzzi G. 1997. Xenotransplantation: problems and prospects.Nephrol Dial Transplant. 12 (Suppl 1):59-64. Schneider MK, Seebach JD. 2011. Xenotransplantation literature update, January-February 2011. Xenotransplantation. 18:147-50. Yamada K, Yazawa K, Shimizu A, Iwanaga T, Hisashi Y, Nuhn M, O'Malley P, Nobori S, Vagefi PA, Patience C, Fishman J, Cooper DK, Hawley RJ, Greenstein J, Schuurman HJ, Awwad M, Sykes M, Sachs DH. 2005 Marked prolongation of porcine renal xenograft survival in baboons through the use of alpha1,3-galactosyltransferase gene-knockout donors and the cotransplantation of vascularized thymic tissue. Nat Med. 11:32-4. Schook L, et al. 2005 Swine in biomedical research: creating the building blocks of animal models. Anim Biotch 16:183-90. Lunney JK. 2007. 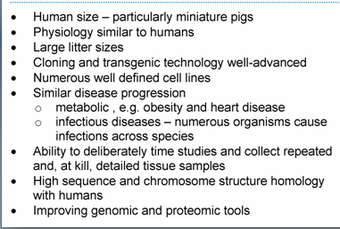 Advances in swine biomedical model genomics. Int J Biol Sci. 3:178-84. Swindle MM, Smith AC. 2007. Swine in biomedical research. In Conn PM, ed. Sourcebook of Models for Biomedical Research. Humana Press Inc, Totowa, NJ. Pp: 233-9. Arner P. 2005. Resistin: yet another adipokine tells us that men are not mice. Diabetologica. 48:2203-5. Spurlock ME, Gabler NK. 2008. The development of porcine models of obesity and the metabolic syndrome. J Nutr. 138:397-402. Litten-Brown JC, et al. 2010. Porcine models for the metabolic syndrome, digestive and bone disorders: a general overview. Animal. 4:899-920. Brambilla G, Cantafora A. 2004. Metabolic and cardiovascular disorders in highly inbred lines for intensive pig farming: how animal welfare evaluation could improve the basic knowledge of human obesity. Ann 1st Super Sanitá. 40:241-4. Sébert SP, et al. 2005. Childhood obesity and insulin resistance in a Yucatan minipiglet model: putative roles of IGF-1 and muscle PPARs in adipose tissue activity and development. Int J Obes. 29:324-33. Kim K-S, et al. 2004. Investigation of obesity candidate genes on porcine fat deposition quantitative trait loci regions. Obes Res. 12:1981-94. Bloor CM, et al. 1992. The pig as a model of mycardial ischemia and gradual coronary occlusion. In: Swindle MM, Ed. Swine as models in biomedical research. Ames, IA. Iowa State Univ Press. Pp 163-75. Gootman PM. 2001. Cardiovascular system: In: Pond WG, et al. Eds. Biology of the domestic pig. Ithaca, NY. Cornell Univ Press. Pp 553-9. Reffelmann T, et al. 2004. A novel minimal-invasive model of chronic myocardial infarction in swine. Coron Artery Dis 15:7-12. Leor J, et al. 2009. Intracoronary injection of in situ forming alginate hydrogel reverses left centricular remodeling after myocardial infarction in swine. J Amer Coll Cardiol. 54:1014-23. Spuentrup E, et al. 2009. Molecular magnetic resonance imaging of myocardial perfousion with EP-3600 a collagen-specific contrast agent: initial feasibility study in a swine model. Circul. 119:1768-75. The RETHINK project: an assessment of the potential impact of toxicity testing in the minpig as an alternative approach in regulatory toxicity testing. Special Issue. J Pharmacol Toxicol Methods. 2010. 62(3):158-242.
a. Webster J, et al. Ethical implications of using the minipig in regulatory toxicology studies 62:160-6.
b. Ellegaard L et al. Welfare of the minipig with special reference to use in regulatory toxicology studies 62:167-83.
c. Van der Laan JW, et al. Regulatory acceptability of the minipig in the development of pharmaceuticals, chemicals and other products. 62: 184-95.
d. Bode G, et al. The utility of the minipig as an animal model in regulatory toxicology. 62:196-220.
e. Forster R, et al. The minipig as a platform for new technologies in toxicology 62:227-35. Svendsen O. 2006. The minipig in toxicology. Exper Toxic Path. 57:335-9. Rainsford KD, et al. 2003. Gastroinestinal mucosal injury following repeated daily oral administration of conventional formulations of indometacin and other non-steroidal anti-inflammatory drugs to pigs: a model for human gastrointestinal disease. J Pharm Pharmacol. 55:661-8. Lind NM, et al. 2007.The use of pigs in neuroscience: modeling brain disorders. Neurosci Behav Rev. 31: 728-51. Pearce AI, et al. 2007. Animal models for implant biomaterial research in bone: a review. Europ Cell Mater. 13:1-10. Brandt KD. 2002. Animal model of osteoarthritis. Biorheology. 39:221-35. Little CB, Smith MM. 2008. Animal models of osteoarthritis. Curr Rheumat Rev. 4:175-82. Turner AS. 2001. Animal models of osteoporosis – necessity and limitations. Europ Cell Mater. 1:66-81. Wang JF, et al. 2000. Molecular and cell biology of skin wound healing in a pig model. Connect Tiss Res. 41:192-211. Sullivan TP, et al. 2001. The pig as a model for human wound healing. Wound Rep. Regen.9:66-77. Godin B, Touitou E. 2007. Transdermal skin delivery: predictions for humans from in vivo, ex vivo, and animal models. Adv Drug Del Rev. 11:1152-61. Cuttle L, et al. 2006. A porcine deep dermal partial thickness burn model with hypertrophic scarring. Burns. 32:806-20. Jacobi U, et al. 2007. Porcine ear skin: an in vitro model for human skin. Skin Res Tech. 13:19-24. Velander P, et al. 2008. Impaired wound healing in an acute diabetic pig model and the effects of local hyperglycemia. Wound Rep Regen. 16:288-293. Wang S, et al. 2007. The miniature pig: a useful model for dental and orofacial research. Oral Dis. 13:530-7. Rimondini L, et al. 2005. Tissue healing in implants immediately placed in postextraction sockets: a pilot study in a mini-pig model. Oral Surg Oral Med Oral Pathol Oral Radiol Endod. 100:E43-50.